Ideal for any Home Environment. Unit can be conveniently mounted on the countertop or wall, freeing up valuable space. Offers professional grade power in the home.Ideal for any Salon Environment. Space saving ergonomic design helps reduce clutter in the workplace. 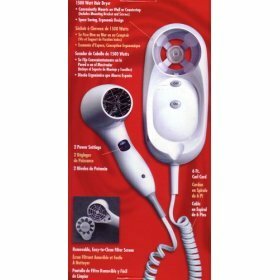 Delivers 1500 Watts of power to meet all your professional needs.Features:- 1500 Watts Hair Dryer- Space Saving, Ergonomic Design- 2 Power Settings- Removable, Easy to Clean Filter Screen- 6 Foot Curl Cord- Automatically Shuts Off When Placed in Base Unit- Magnetically Secure Handset Easily Detaches from Base Unit.